The Colorado River, the force that carved the Grand Canyon, has always been at the center of the canyon experience. It was from the river that the canyon was originally surveyed and mapped, and today it remains one of the only ways to access many parts of Grand Canyon National Park. 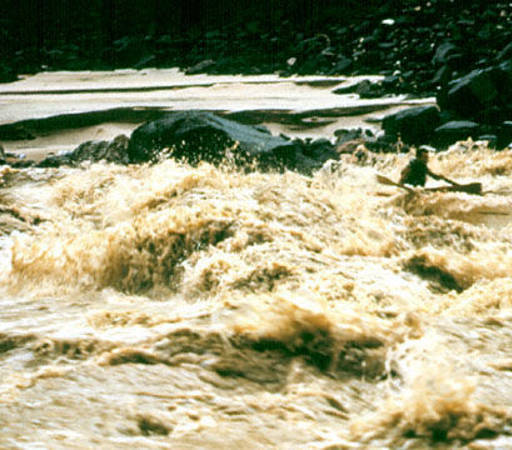 River runners, the daredevils who guide boats through the rapids, have been an integral part of the exploration and exploitation of the canyon, beginning with the Powell expeditions in 1869 and 1871. Many have since followed in their footsteps. Commercial river running has seen its share of changes over the years. River runners of the past are remembered and revered for their courage, fortitude, and determination to understand the river and its rapids. Boats have changed over time and nearly everything has been used to attempt a river run, from a simple life vest to high-speed jet boats. The days of cork life vests are over and river running through the park is now heavily regulated, but the passage is still risky and requires consummate skill. The tight-knit river running community shares a camaraderie and a very specific sense of humor. Special Collections and Archives holds many stories of early river runners, including rugged and crass Georgie Clark and sophisticated Margaret and Fred Eiseman, as well as Norm Nevills, the Kolb brothers, Buzz Holmstrom, and tragic Glen and Bessie Hyde. These and other river legends still influence those that take to the water today.